The men’s and women’s tennis teams started hot and have stayed hot so far this year as they both take the ACC by storm. While the men swept both the team and individual title at NCAAs last year and came into the year as the top dog, the women’s team has more quietly made its mark on the ACC. The women’s team is 17th-ranked in the nation and completed a weekend sweep of Notre Dame and Louisville to enter the next week of ACC play. The team is 17-3 overall and 7-1 in ACC play. On March 22, the Deacons were at Notre Dame for the first of two road matches over the weekend. Junior Chandler Carter and senior Emma Davis got the momentum started for the Deacons, winning on the top court. Redshirt junior MC Meredith and sophomore Eliza Omirou quickly followed suit, winning 6-4 in the second spot. 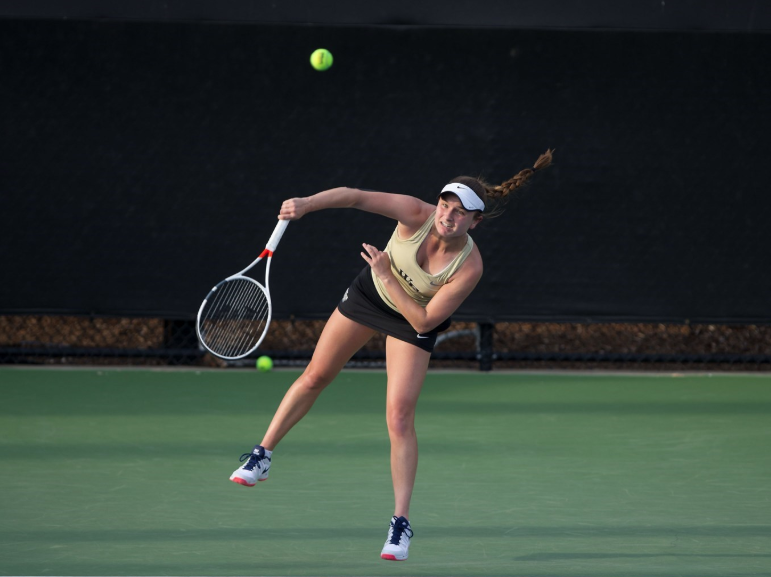 Wake Forest took a 3-0 lead as freshman Peyton Pesavento won on court six and Davis followed with a victory on court one. Carter clinched the match with a three-set decision. Omirou put the fifth point up for Wake Forest on court two, winning the final two sets after dropping the first. The team then faced the Louisville Cardinals in Louisville and completed the weekend sweep with a 6-1 win. No. 28 duo Chandler Carter and Davis won for the Deacons early, garnering the doubles point. Louisville took the court three decision, making it the responsibility of Eliza Omirou and MC Meredith to grab the win, which they did. Louisville evened the match to 1-1 at the fourth spot in singles, but that was their only point of the match. Carter’s victory pushed the Deacons to a 2-1 lead. Davis followed on court one making the tally 3-1. Senior Anna Ulyashchenko clinched the match for the Deacons, winning in the second spot. Omirou and Pesavento both won and the Deacons cruised to the 6-1 ACC road win. Not to be outdone, the second-ranked men’s team took down No. 14 Notre Dame, just like the women at Notre Dame, before beating Boston College Sunday. After the weekend, the Deacons are sitting at 21-3 and remain undefeated in the ACC at 7-0. Against Notre Dame, Wake Forest quickly took the doubles point with victories from junior Borna Gojo and redshirt junior Alan Gadjiev in the first doubles spot and freshman Siddhant Banthia and redshirt senior Julian Zlobinsky in the third doubles spots. Petros Chrysochos took the win at the second singles spot, while Banthia won on Court 5, and Efstathiou clinched the victory with a win at No. 6 singles. Gojo then got the victory at the top singles spot, and sophomore Rrezart Cungu won at No. 4 singles. The Demon Deacon men’s tennis team got yet another ACC win at Boston College on March 24, picking up another 6-1 decision. Wake Forest took the doubles point victories at the No. 1 spot from senior Petros Chrysochos and sophomore Bar Botzer and No. 3 spot from freshman Melios Efstathiou and Gadjiev. Cungu quickly pushed the lead with a 2-0 win at No. 3, followed by win on Court 4 by Efstathiou. Chrysochos clinched the match for the Deacs, winning in the top spot. Banthia and Gadjiev brought the Deacons lead up to 6-0 with wins at the fifth and sixth positions. Boston College picked up its lone point at No. 2 singles to close out the match, but it was too late for the Eagles to come back. The men’s team returned home and beat No. 11 North Carolina on March 27, while the women go back on the road to play Florida State on March 29 and Miami on March 31.